History and other allied social science disciplines are basically abstract and amorphous knowledge enterprises. While making it too empirical and tangible often means presenting society blanched, and leveling out much its complexities and emptying the various socio-cultural and economic processes at play. Presenting society in such encapsulated, discrete, atomistic form has its takers too and our flawed school textbooks set off such takes on society, its past and present on impressionable minds, something majority of us are unable to shake off. On the other hand attempting to make social sciences more holistic, embodied is not simply a matter of method but more fundamentally an understanding of the kind of knowledge frames required to understand society. Thus here matters of ontology and epistemology also need to be grappled with. In such a sense then philosophy and social theory play an important role in giving direction and unraveling its constitutive elements - let it be history, politics or sociology. This further implies another aspect - social science is grounded in concepts. Concepts like class, community, gender, power etc become central in comprehending society in its details, complexities and nuance. So then we have a Catch 22 situation - while social science being abstract is a problem but it's only in its abstractness that it becomes relevant and meaningful. And when attempted to render social sciences as nothing more than information, facts, which are best taken cognizance of through mere memorization, questions of its relevance and utility naturally arises. (But let us also not assume that the physical sciences and mathematics are any less abstract. 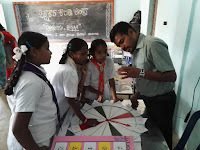 In fact deductive and inductive methods that define much of inquiry based research is an abstract process despite certain levels of empiricism and universal applicability that the sciences may claim to its credit.) So how do we settle this quandary for teachers much less for kids? As some way of responding to such a situation, I over the last year and more and being a member of Azim Premji Foundation have come out with some activities catering to middle school curriculum which while seeking to concretize certain key aspects of historical and sociological understanding does not undermine certain abstract and complex nature of inquiry that is a key to understanding of history in its nuanced import. While it is difficult to explain all the activities for mere verbalization may not capture its full essence, I will highlight three which I (and along with my dear colleague Shankar whose excellent felicity with paper, shears, scissors and adhesive enabled these ideas to be put into concrete shape.) think deal with abstract but key understanding necessary for better appreciation of history. These activities contrived into some sort of game are more like templates that can be used to explain several other ideas and concepts, both in sciences as well, And in such a sense I cannot by any stretch claim originality of form but maybe I could merely make proclamations, with some immodesty, of innovation where some staid and worn out forms are used to put across content which help in rendering history less particularistic and discrete. So the content here could include understanding of social stratification, ideology, state, revenue systems, popular culture and more, which are essentially concepts that help to veer the discipline away from a pedagogic process where merely recalling and memorization some atomized facts are seen as history's default attribute. 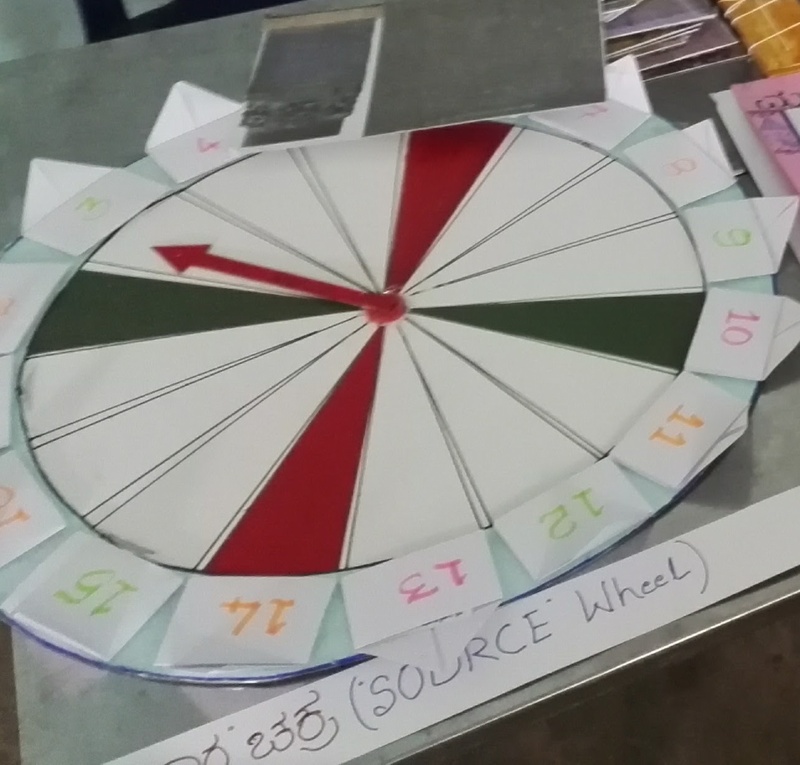 The first activity is grafted on a roulette to help one to understand the importance of sources in writing of history. While we all know history as a compilation of facts, it is important to understand how these facts become facts. How a process of selection, interpretation is involved in construction of history. So one needs to spin the roulette pointer and the slot where it stops, contains a historical fact. For example it could be a historical fact of Pulekesin II making a land grant to a temple...or it could be the fact of Akbar being a good hunter...or certain place known by a name...so how do we know all these facts of history? 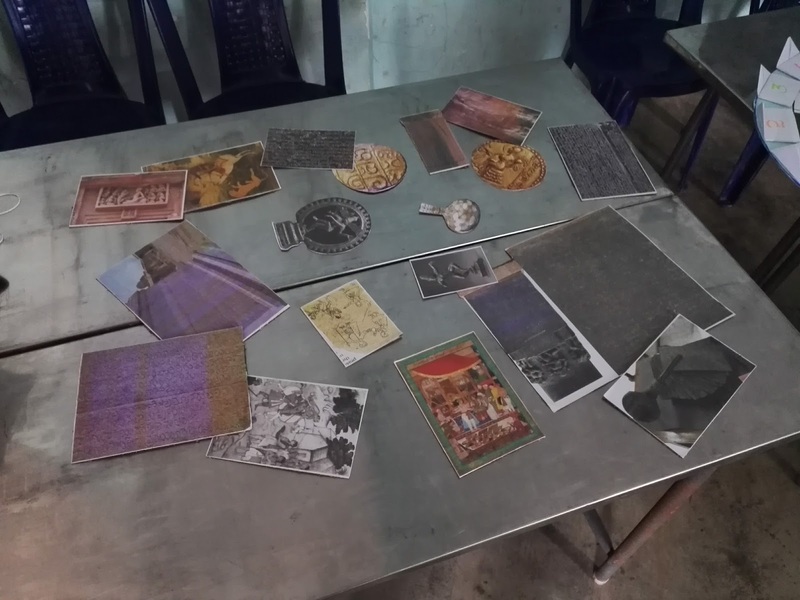 Then as the photo indicates we have several forms of sources - coins, paintings, inscriptions, manuscripts...(as cards) So the person will have to look at all the sources carefully and figure out which among the lot best testifies and corroborates the historical fact. So in such a sense the participant becomes a historian and applies the methods of a historian - observation, inference, interpretation, comparison etc which involves due diligence and application of several skills. The roulette with its pointer. The numbers are slots in which are hidden certain facts of history. These are the different sources which have to be studied carefully which helps throw light on the facts in history emerge. 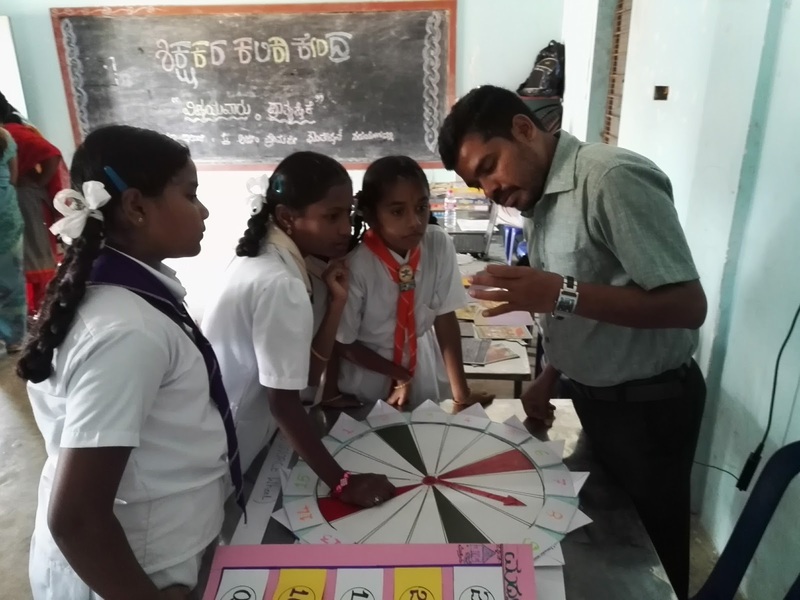 The second activity was an improvisation of snake and ladder game grafted on in such a way to help in understanding the life of a peasant in medieval India. So here we have four players with each player having a counter which he moves as per the number thrown up with the roll of a dice. From the beginning of sowing season to harvest, a farmers life is riddled with both uncertainties and possibilities. While some uncertainties are natural like drought or pestilence, some are social - excess taxation, wars etc. 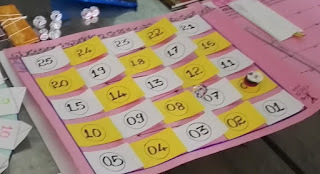 So each slot on the gameboard has some uncertainty - good and bad, social and natural - waiting to happen to each player (a peasant) which can either set her back or even set her ahead on the path of bountiful harvest. Understanding life of medieval peasantry - the socio-political troughs that constantly characterized a peasants life. But as was the case in medieval India, more of the uncertainties wrought by the social and political system made their life rife with agonizing distress. Secondly it were the fruits of their labour - the taxes (surplus) provided by them that shaped all the empires across the world and most of the time in history. In such a sense most empires were largely agrarian something that escapes our cognition and therefore is something which needs emphasis. This activity/game underscores both this understanding. Yet another activity that I conjured up was basically improvising a game of probability with several dices and one polyhedral dice. 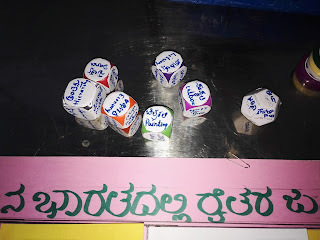 The 12 sides of the polyhedral dice has different concepts or terms like class, state, religion, taxes, wars, monarchy, power, kingdom etc written on it. One had to roll the polyhedral dice and the side and the term facing up becomes the concept that has to be explained. For this you roll four or five more dice on each of whose sides are written different terms that correspond or share some relationship to the terms written on polyhedral dice. So for example one rolls the polyhedral dice and it shows up the term kingdom facing up, the same person rolls the four dice. Now supposing he gets terms like Chalukyas, subjects, republic, cities on the four dices. Then the player has to figure out how many of these terms relate to the term Kingdom (as indicated in the polyhedral dice). So in this instance Chalukyas obviously is an example of a kingdom and so it bears itself out. The second dice has 'subjects' as a term to relate to. This too can be seen to relate to kingdoms for kingdoms were constituted by King's subjects. The third and fourth term cannot be seen as having a relationship for kingdoms are not republics (indeed are its anti-thesis) and while cities can be seen to have some relationship but rather tenuous. So then the player sets aside the two dice bearing the term of 'Chalukyas' and 'subjects' but rolls the other two dice to secure those corresponding terms or concepts which seem to have best relationship with the concept of Kingdom. Here there is no concept of right or wrong answer but more of how convincingly one is able to reason and establish a link or relationship between all the terms or concepts. What is important is the teacher having a very clear understanding of not just various concepts which are important for greater comprehension of social sciences but the teacher also figures out how matters or issues which transpire in society are organically linked to several other whose linkages may not be so obvious. So in the above example when dealing with the idea of kingdoms the teacher recognizes that while kingdom is a political phenomenon it also is linked to agrarian systems and taxation which as such operate in the social and economic realms. i.e. most empires were built on the surplus produced by the peasants appropriated by the ruling classes in the form of taxation and revenue. All these activities can be used at different levels of teacher's classroom engagement - to initiate a topic, to reinforce understanding or to assess a students understanding. Similarly there also were some activities on time and division of labour. 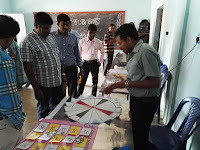 Such activities here are deeply analytical, comparative and inferential and not a bit, recollection and recall based. Further I would also imagine that all the activities here are also 'constructivist' where certain broad parameters and framework is provided but a student is expected to apply her faculties and skills to obtain an understanding which is relational and personal. This attempt also proves that even abstract learnings in social sciences can be concretized with teaching-learning materials (TLMs) but these TLMs cannot be universalized or replicated. TLMs are of course needed but such TLMs have to emerge from a teacher's engagement with both the discipline and demands of democratizing pedagogy. But yes, here the teacher has to be sound in having a deep fundamental understanding of social sciences, its hows and whys, its structure which results in emergence of historical or sociological knowledge as something much more than a mere decontextualized litany of names and terms. My colleague Shankar explains the whys and hows of the activities and games that he so painstakingly prepared to both teachers and students.